it was my dad's birthday yesterday yay. 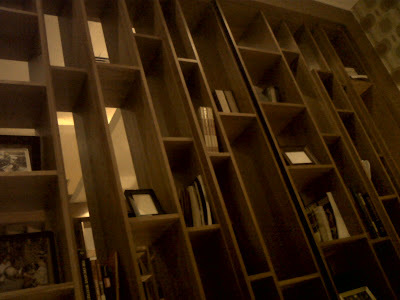 he threated me and my mom to The Apartment, a cool eating place, which is located in Gracia's Tower, Ground Floor, Kuningan (next to Australian Embassy that got unbombed years ago). so what's cool about this place? well it has 6 different areas suchas the bedroom, the lounge, the kitchen & dining room, the library, the bathroom and the jacuzzi terrace. 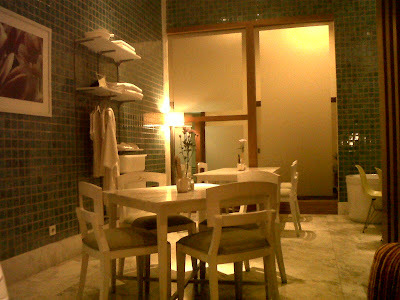 The Bathroom The Library The Bedrooma friend told me that The Apartment is also existed in Malaysia. kewl. 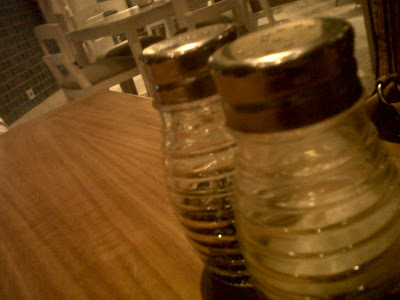 salt n peppa, a cellphone-cam artwork photography captured by me. lol. 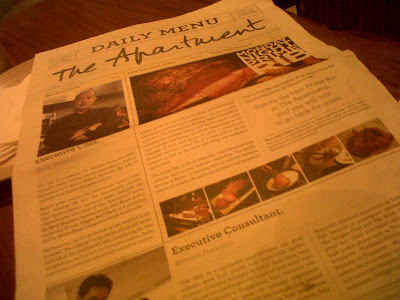 :p the menu looks like a newspaper hahaha very creative, too bad there aren't any lampuhijau kind of headlines. 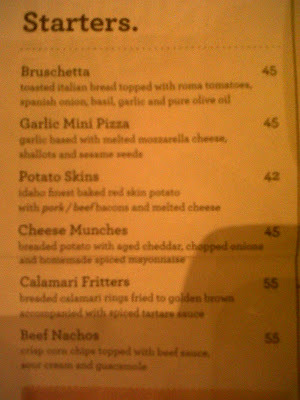 :p well the night's still young eh, we ordered Garlic Mini Pizza as a Starter (IDR. 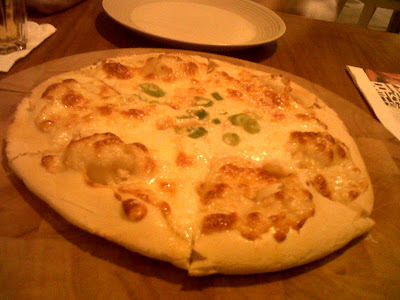 45.000 tax not included) it tasted like garlic bread mixed with mozarella cheese...which is great. 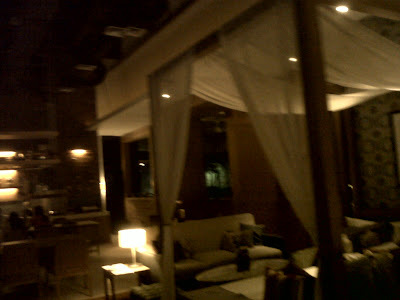 hehehe i give it 8 out of 10. next, my dad ordered Roasted Chicken (IDR. 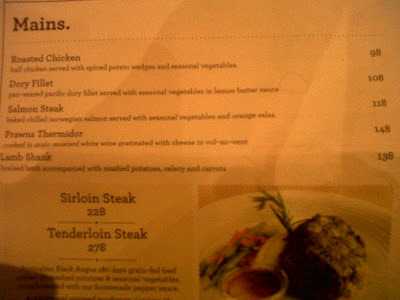 98.000 tax not included) as a main course. 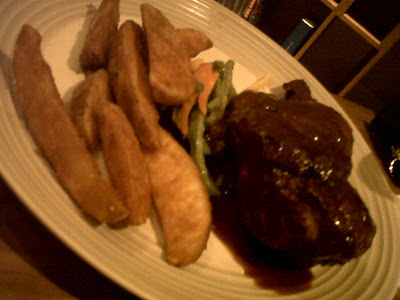 nom nom nom, we added tabasco sauce to teh marinated tasty roasted chicken, served with potato wedges and vegetables. hohoho. 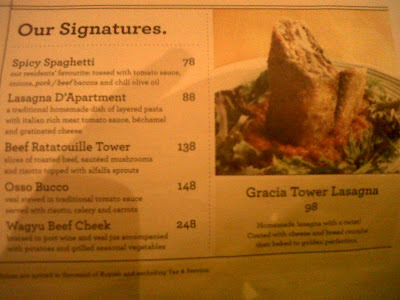 i give this one 8.5 out of 10. i ordered "Beef Ratatouille Tower" (IDR.138.000 tax not included) and my mom ordered "Gracia Tower Lasagna" (IDR.98.000 tax not included). Both under the "Our Signature" section of the menu, which they claimed "you can't find these signature food anywhere but here". lol. Gracia Tower Lasagna (lol @ gracia, how narcissistic teh building iz) tastes just like your ordinary lasagna, delicious yet it gave your stomach that qualmish feel hohoho (you know how it feels, when you didnt want to eat anymore though youre not hungry, what is it called? nausea?). i give it 7 out of 10. 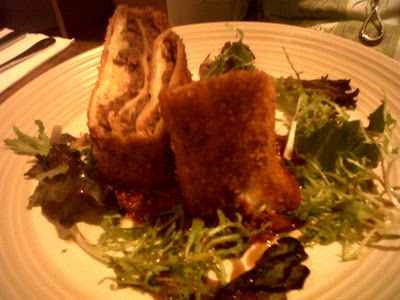 Beef Ratatouille Tower! I ordered this one because of the "ratatouille" word (i like the animation movie, ive been wondering hows it tastes all the time hahaha). 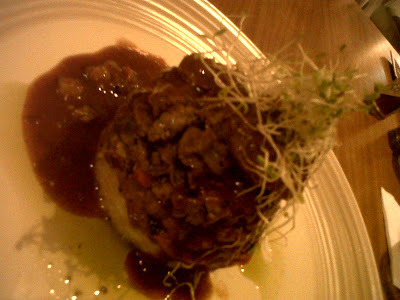 Turns out that Beef Ratatouille Tower is just a slices beef on top of risotto rice with some vegetables. 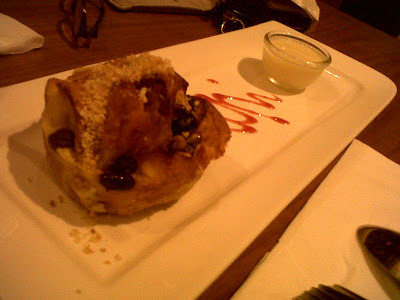 uhmm it tasted delicious, but its too expensive and small, i think. 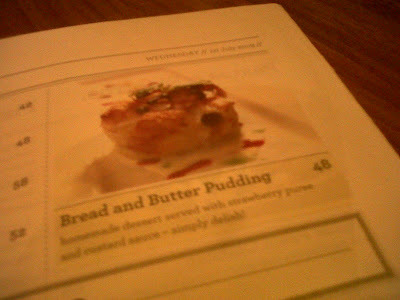 i give it 8 out of 10. ofcourse we wont go home without eating the desserts first, we ordered Bread and Butter Pudding (IDR.48.000 tax not included) uhmm... mediocre. i give it 7 out of 10.
oh yeah i forgot, drinks are quite expensive (especially if youre spending too much eating at warungs, just like me hahaha), i ordered ginger ale soda and it costs around IDR. 20.000-IDR.30.000. Also you need to prepare at least IDR. 150.000 on yer pocket hahaha (if ya wanna eat). 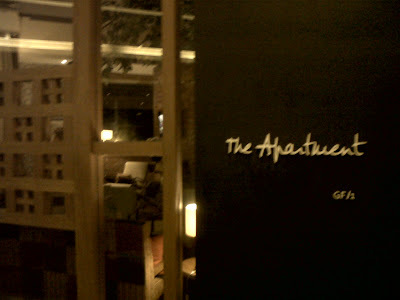 overall i give The Apartment 8.5 out of 10.